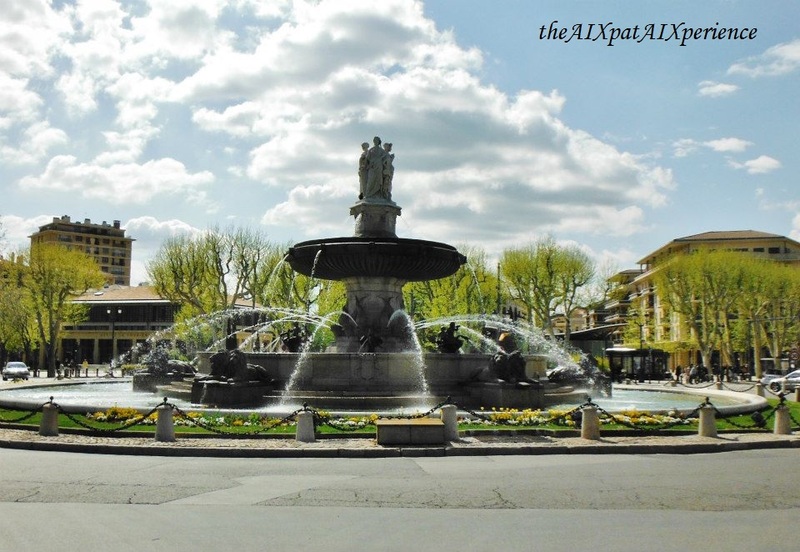 France is known for its endless rond points, or ’round-abouts’, so, Aix, being a beautiful city in the South of France, is no different. There are countless rond points scattered throughout Aix; however, Aix’s rond points’ are unique: About 85% of them come equipped with fountains. There are so many rond-points-fountains, so-to-speak, that it would be impossible to discuss all of them in one post; however, there is one fountain that is mètres above the rest: it is the Géant of the Aixois fountains and is called, La Fontaine de la Rotonde, aka La Rotonde. When caught AIXploring (I couldn’t help it), you can’t miss La Rotonde. Why? Because it’s in the heart of the city center and it’s surrounded by four large streets, the main street being Le Cours Mirabeau. So, of course, it screams: Take my PICTURE. Before I moved to Aix permanently, I would take a photograph of this fountain during each visit because it’s just that Awesome, I swear! It’s no Trevi fountain with its sculptures, but it comes close in Awesome-ness, especially during Noël. It was May 2014, the sun was high in the Mediterranean sky and there was a fresh, cool breeze coming down from the mountains. 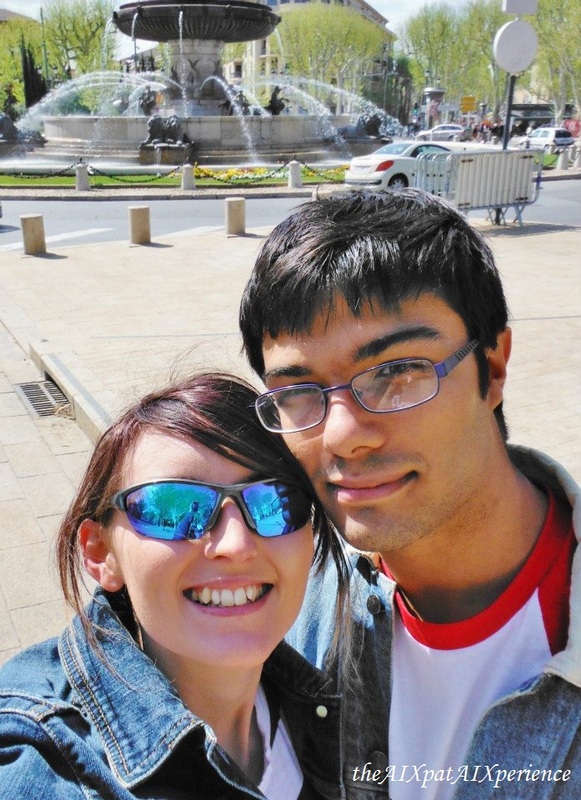 I was AIXploring – seeking undiscovered streets and parcs. It was that night when I discovered I was no longer one of the touristes. I was uploading pictures from the day and I realized I didn’t take a photograph of the fountain. I guess when you have about 10+ photos of the same fountain from different times of the year, then that’s enough. As happy as I am that my touriste status is now non-existent, I refuse to let this lack of being a touriste stop me from AIXploring. 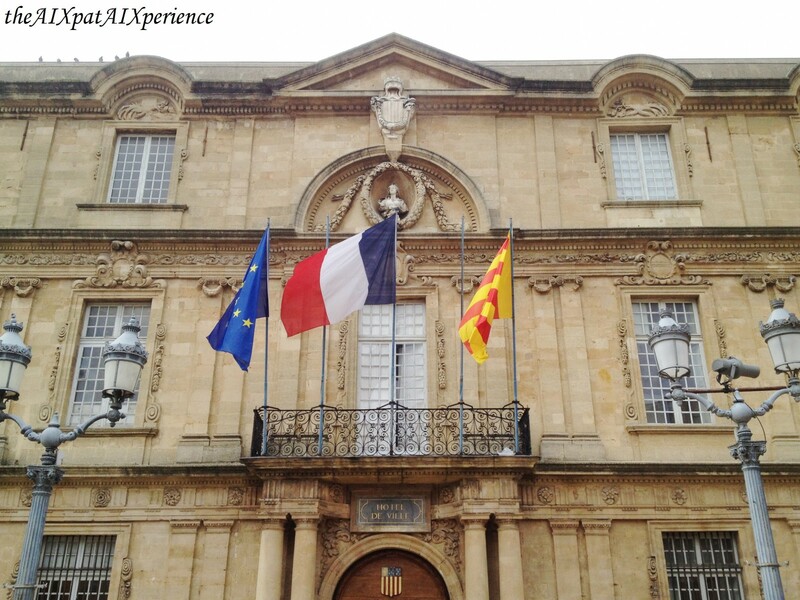 In fact, it’s the touristes who remind me who I once was and enable me to keep my enthusiasm alive for the natural and artistic beauty throughout Aix and to share this enthusiasm with the locals as well as with other potential expats and tourists. It’s easy to dismiss the beauty of your surroundings when you’ve seen the same thing all your life. La Rotonde combines the three most important aspects of Aixois culture: Agriculture, Justice, and the Arts. There’s no better way to get a glimpse of all three of these aspects in one place than through admiring the sculpture at the top of the fountain. *La Rotonde during Noël. La Rotonde is at the head of Le Cours Mirabeau, the most popular street in Aix. The (clothes, accessories, and “anything-sans-food”) marché fixes itself on Le Cours Mirabeau on Tuesday’s and Thursday’s. Thus, there’s no better way to spend a Tuesday morning than taking about 5+ minutes to admire the fountain followed by a shopping spree at the marché. Cool fountain + Cool scarves = Successful morning. La Rotonde connects the old with the new – in more ways than one might think. The size of the fountain, its cast-iron basin (it was the first of its kind in Aix – c. 18601), and its open-ness (there are no walls/gates surrounding the fountain) symbolize modernity, while the type of sculptures as well as other designs on the fountain symbolizes the past. Thus, from its construction, it was known as a link between the past and future. Not only is the fountain a symbole of modernity, but it also links the old part of the city with the new part of the city. There’s not a better way to traverse between the old city and new city than to choose the path that enables you to admire the fountain that links them together. *Les Allées Provençal, Aix’s Shopping Center, can be seen behind La Rotonde. La Rotonde is situated within about 1 minute (walking) of the best crêpes place Ever: Crêpes à GoGo. Crêpes à GoGo, located at 2 av. Victor Hugo, is an underground (literally) crêperie that sells crêpes à emporter (“to go,” aka to eat while walking around). There’s a variety of sucre, or sweet, crêpes such as Sucre (crêpe with sugar), Nutella et Banane (Nutella and banana), Citron et Sucre (lemon and sugar), and the liste goes on. They also sell salé, or salty, crêpes such as jambon et fromage (ham and cheese), La Ratatouille (Ratatouille in a crêpe), and this liste also continues. There’s nothing better than eating a crêpe au Nutella in front of an amazingly 12 mètres (~39 ft) high, 32 mètres (~104 ft) wide fountain. In fact, the fountain’s grandeur is enough to knock you to your knees; but, add the beauty to the mix and you will want to have a seat on one of the benches that face the fountain. 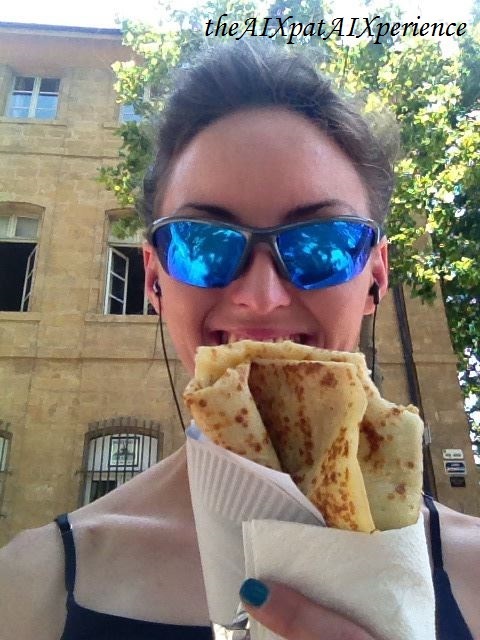 So, why not do it in typical French style: with a crêpe in your hand? *La Rotonde is directly to the right of me (your right). So, now that you’re hooked on visiting La Rotonde, you’re probably wondering: when is the best time to visit? It’s beautiful all year round; however, I find that it’s most beautiful at night during the Winter. 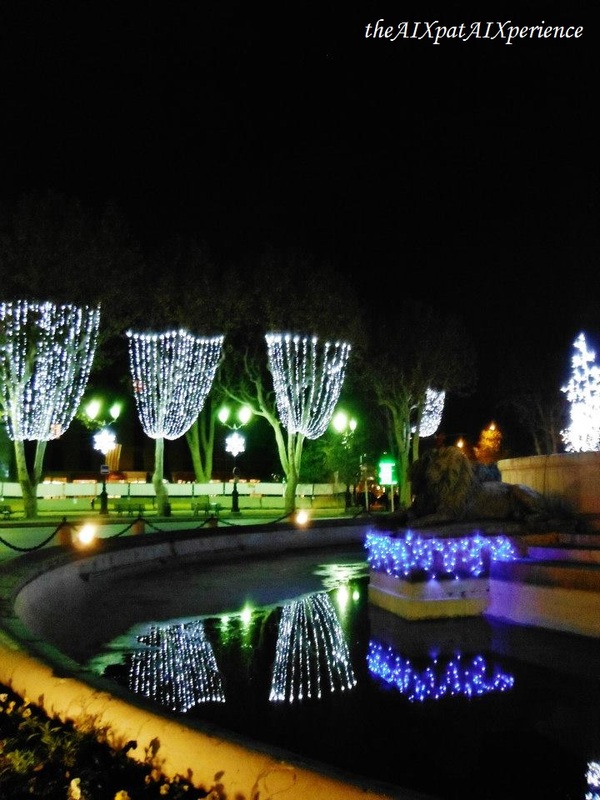 During the spring/summer, the fountain is covered in flowers, which adds to the overall mystic properties the fountain has to offer; however, during the winter, the fountain is decked out in ‘Christmas’ lights. There’s nothing more magical than a fountain adorned in classic holiday lights. What is your favorite part about La Rotonde? 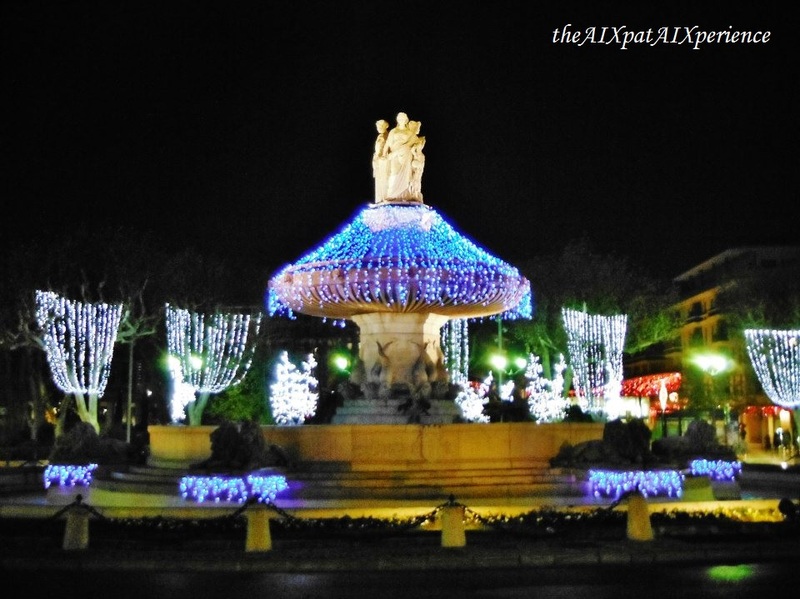 What other fountains in Aix do you recommend? 1The date is at the courtesy of the Histoire de la cité d'Aix-en-Provence: La fonatine de la Rotonde plaque that is situated in front of the fountain.